A 25 weeks gestation male infant, birth weight 918 g, had a percutaneous central venous catheter (PCVC) (Premicath, Vygon) inserted into the left basilic vein on day 6. Necrotising enterocolitis and Staphylococcus epidermidis sepsis complicated the clinical course. On day 36, when full enteral feeds were established, a decision to remove the PCVC was made. It was withdrawn until it became “stuck” with 4 cm remaining within the vein. Firm traction and limb manipulation was unsuccessful in releasing the PCVC. Ultrasound of the arm demonstrated an echogenic focus adherent to the PCVC and the venous endothelial surface, preventing removal. The PCVC was surgically removed under general anaesthesia. The PCVC was noted to be covered with a tissue sheath adherent to the venous endothelial surface. Histopathology confirmed the sheath to be calcified fibrinous tissue. It is a natural response of the human body to coat the surface of artificially implanted devices with a proteinaceous film. This “fibrin sheath” can form on the surface of central venous catheters within 24 hours. Fibrin sheaths have been implicated in catheter related sepsis, but this remains unproven.1 Reports of the sheath obstructing removal are rare.2,3 Controlled traction was not successful in releasing the catheter. In this case the infant required surgery under general anaesthesia to ensure safe and complete removal. 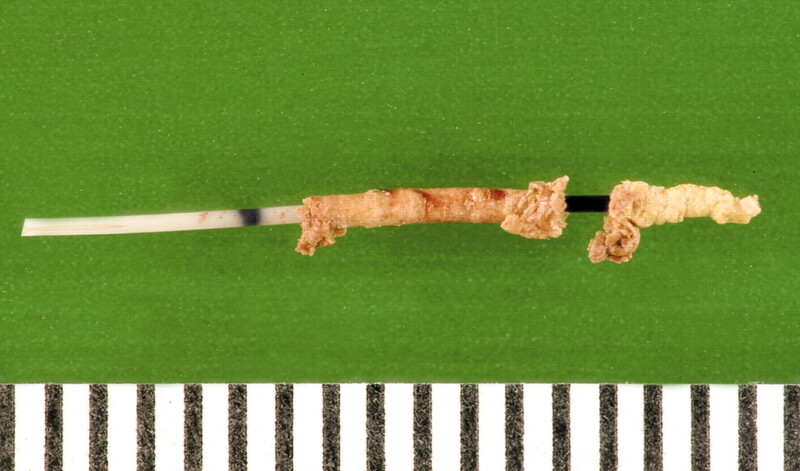 PCVC tip with fibrin sheath (scale in millimetres). Lloyd DA, Shanbhogue LKR, Doherty PJ, et al. Does the fibrin coat around a central venous catheter influence catheter related sepsis? J Pediatr Surg1993;28:345–9. Ng PK, Ault MJ, Fishbein MC. The stuck catheter: a case report. Mt Sinai J Med1997;64:350–2. Gladman G, Sinha S, Sims DG, et al. Staphylococcus epidermidis and retention of neonatal percutaneous central venous catheters. Arch Dis Child1990;65:234–5.